Interactive Vision Studio | Christoph Bartneck, Ph.D.
At the Designed Intelligence Research Group of Department of Industrial Design at the Eindhoven University of Technology, we build an Interactive Vision Studio. We use a single camera and a single projector, which eliminates the need to align and synchronize multiple screens and cameras. Both, the camera and the projector have a resolution of 1920 x 1080 pixels, which means that they have a 16:9 aspect ratio. Given the width of the projection screen of 6 meters, the screen should be 3.37 meters high to achieve the 16:9 aspect ratio. However, even tall people rarely exceed 2 meters in height. 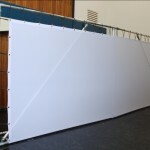 We therefore decided to exclude one third of the vertical dimension, which resulted in final dimensions for the screen of 592 cm x 222 cm. It follows that the projection will use 1920 x 720 pixels. The projector had to be placed at a distance of 12 meters from the screen to achieve this projection size. 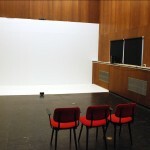 The Interactive Vision Studio is located in an old server room that features soundproof walls and only small windows that can easily be darkened. The room features a 7.1 surround sound system. Each of the eight audio channels can be controlled separately through the computer. 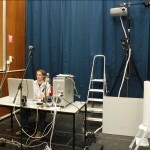 The sonification of the users’ movements is therefore possible. In addition, we build a mobile screen. Since the camera and the projector are attached to a mobile tripod, we are able to setup the whole system at any given location, such as conferences or art festivals. 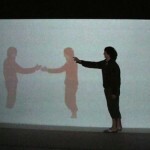 The first project realized in the studio is the an interactive visual canon platform, or in short IVCP. In music, a canon is a composition employing one or more repetitions of a melody, played with a certain delay. The initial melody is called the leader, and the imitative melody is called the follower. The follower must be based on the leader by being either an exact replication or a transformation of the leader. Experimental film maker Norman McLaren introduced the concept of the canon to the visual arts and, in 1965, received the Canadian Film Award for his movie “Canon”. More recently, the comedy duo Itsumo Kokokara, consisting of Kazunari Yamada and Hidenori Kikuchi, has included the performance of a visual canon as part of the daily show “Pythagoras Switch” on the Japanese National television channel NHK. The creation of a new visual canon is very difficult, since a whole team needs to study the specific sequence of new movements. Only when all actors perform the canon correctly, can the design of it as a whole be evaluated. The long duration of each iterative cycle is a major obstacle in the design process of visual canons. We developed an interactive visual canon platform that supports the creation of visual canons and that can be used to extend them in real time. 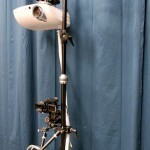 It enables an actor to create visual canons by himself. Lifting the reliance on other actors considerably shortens the iterative cycles in the design of a visual canon. We will now provide a short summary of the technical implementation. The key characteristic of a canon is its structural consistency; only the leader has the freedom to perform, the followers must conform to the leader movements. Also, each movement is performed at the same position by all the actors of the canon, one after the other. The algorithm in our solution software takes advantage of the strict algorithmic nature of the canon. In practice, the only degree of freedom in the actors performance lies in the movements of the leader. These are restricted to the forward direction to avoid risk of overlap with the followers. When the actor approaches the screen, he can use the position of his body to select items from the menu. We implemented several performance modes, including a tutorial, a beginners mode and an advanced mode. After the actor has selected the desired music, he steps to the left to start the performance. He moves forwards in the rhythm of the music and the IVCP automatically projects the followers on the screen. Once the actor reaches the end of the screen, the recording stops and the whole visual canon is played back. The actor can now evaluate the quality of the performance and start a new sequence if desired. He may also save the performance or upload it to YouTube. In summary, we developed an interactive visual canon platform that allows actors to rapidly design a visual canon performance.